John C. Nagy III, Jen Jacob, and Michael DeBartolo in The American Play. Photo credit: Melissa Balan. Raw, contemporary and edgy, The Dirty Blondes' The American Play is the story of college students all over the country. Performed at the New York International Fringe Festival, this play by Ashley Jacobson pays strange and twisted homage to Bret Easton Ellis's novel American Psycho. Since coming to a New York City based college, Tim (Michael DeBartolo), a poor kid with a lifetime of bullying and abuse, has been obsessed with trying to become friends with rich-kid and egomaniac Luis (John Charles Nagy III). The two bond over their love of American Psycho, and the fact that they share the names of two of the characters from the book, and Luis sets about mentoring Tim. Treating the book as a manifesto and guide on life, Luis cruelly and diligently turns Tim into a Patrick Bateman-like personality, and the once sweet and sensitive Tim becomes self-involved, materialistic and enraged by everything and everyone. Even his high-school friend Shelly (Jen Jacob), who knows the truth about his life in poverty and abuse can’t get through to Tim, whose worship of Luis becomes obsessive and dangerous. Director Darren Johnston has found interesting ways to interpret and recreate the rage that overpowers these characters. It is also worth mentioning the simple but effective set design created by Jonathan Cottle. There are three plastic sheets that are used to project texts/Twitter messages that break-up the dialogue in the piece. 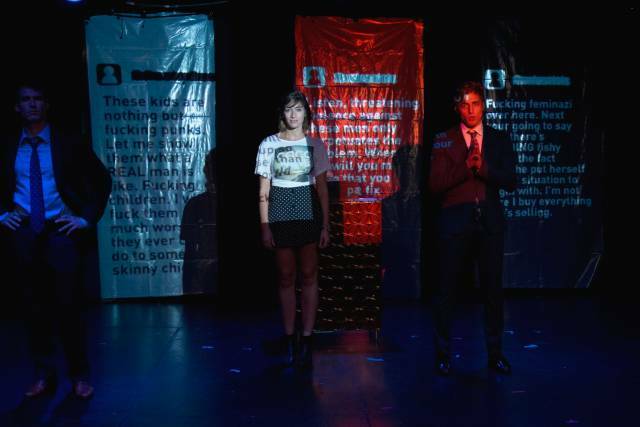 The messages represent both an internal monologue and a commentary on what is happening on stage. The second effective use of the sheets is when the image of the characters are projected during their interrogation, making the sense of their vulnerability and confusion about violent acts palpable. The American Play is honest and frightening because of how recognizable these college students are, influenced by consumerism, media, and the desire to belong. Inna Tsyrlin is an emerging playwright and frequents all forms and styles of theater as much as humanly possible. She is determined to represent productions with insight and empathy for all involved with the theater, those who are both daring and driven to put work out into the world.